Here’s what’s wrong with the world economy: No nation has the will or the way to be the locomotive for global growth. 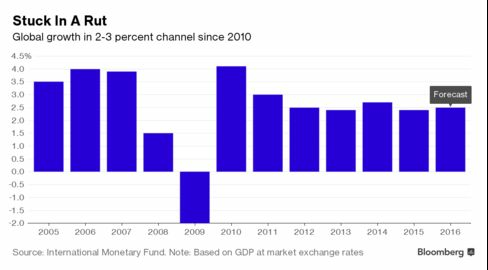 The probable result: World growth will remain trapped in the 2 to 3 percent channel that it’s been in since 2010. That’s a performance that International Monetary Fund Managing Director Christine Lagarde has derided as “the new mediocre” and compares with the 3.6 percent average that prevailed in the five years prior to the 2008-09 global recession. “We have at least another year of moving sideways, of being stuck in second gear,” said Nariman Behravesh, chief economist for consultants IHS Inc. in Lexington, Massachusetts. He sees world gross domestic product expanding 2.8 percent next year after climbing 2.4 percent in 2016. Behind the lackluster out-turn: Monetary policy makers in Japan and the euro zone have “kind of run out of firepower” to spur their economies, said Charles Collyns, chief economist for the Institute of International Finance in Washington. The Bank of Japan is scheduled to report this week on a comprehensive assessment of the efficacy of its monetary measures and decide on its future stance. While fiscal policy will increasingly come into play, it will be mostly a “holding operation” that will keep growth in mature economies more or less steady, Collyns, a former U.S. Treasury official, added. As the world’s largest economy, the U.S. has frequently played the role of global locomotive in the past. But with U.S. growth averaging just 2.1 percent since the end of the recession, American policy makers have been reluctant to see the country take on too much of that role. That sentiment is also evident in the heightened attention that some Fed policy makers have paid to both actual and anticipated movements in the dollar and their impact on the economy. “The nearly 20 percent appreciation of the dollar from June 2014 to January of this year could be having an effect on U.S. economic activity roughly equivalent to a 200 basis point increase in the federal funds rate,” Fed Governor Lael Brainard said in a Sept. 12speech in Chicago. 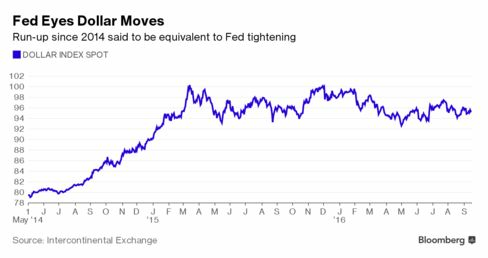 New York Fed President William Dudley indicated in August that central bankers had scaled back their projections of how many times they would raise rates this year because of concern that more hikes could lead to a spike in the greenback. “Policy makers are very protective of what growth they do have,” said David Hensley, director of global economics for JPMorgan Chase & Co. in New York. With the U.S. struggling to advance, “the Fed doesn’t perceive it has the latitude” to see much U.S. demand met by imports. Both Hillary Clinton and Donald Trump have pledged to take a more muscular approach to defending America’s trade interests if elected president in November. Democratic nominee Clinton has said she would appoint a chief prosecutor on trade while Republican Trump has threatened to slap import tariffs on products from China and Mexico. China took up the baton as global growth driver in the aftermath of the last recession, ramping up investment and corporate borrowing to spur the world’s second largest economy. Now, though, it’s struggling with the fallout — excess capacity and increased indebtedness — and shows scant willingness to resume that role. Premier Li Keqiang warned in July that, while the nation will remain a stabilizer for global growth, it also has its own downward pressures to contend with. “China is still a developing country — we can’t shoulder the heaviest burden of the world’s economy,” Li said after a round-table discussion on economic growth, trade and finance with heads of institutions including the International Monetary Fund. If anything, China is grabbing a larger chunk of world trade. Its global export share climbed from 12.9 percent in 2014 to 14.6 percent in 2015, the highest in IMF data going back to 1980. A key driver of China’s gains is its move toward more sophisticated assembly, especially in electronics, which eliminates the need to source components from a vast supply chain across Asia, said Frederic Neumann, co-head of Asian economic research at HSBC Holdings Plc in Hong Kong. China’s export prowess won’t be enough to prevent Germany from pulling ahead of it this year as the country with the largest current account surplus, according to the Ifo Institute. The Munich-based research group forecasts a German surplus in goods and services of $310 billion this year, up from $285 billion last year and topping China’s projected $260 billion in 2016. As Europe and the euro zone’s largest economy, Germany has profited “enormously” from the weakness of the currency, Ifo economist Christian Grimme said in an e-mail. The country could act as an engine for the rest of the Europe if it implemented much more fiscal stimulus than already planned, said Aline Schuiling, senior economist at ABN Amro Bank NV in Amsterdam. That though doesn’t look likely. In touting Germany’s economic performance before parliament earlier this month, Finance Minister Wolfgang Schaeuble portrayed fiscal restraint as an anchor in unsettling times. “Budget policy stands for stability and reliability,” he told lawmakers. Uncertainty over the future of the European Union in the wake of the June vote by the U.K. to exit the bloc is also casting a pall over the region’s economy, according to Schuiling. “Our locomotives have certainly lost some steam” said Peter Hooper, chief economist at Deutsche Bank Securities Inc. in New York.